amarujala.com can change this policy at any time. So, the readers are requested to read the “Last Updated” Date at the top of the page to see when the cookies policy was last revised. Any changes in the policy will be in effect the moment we make any changes in the Cookies Policy on the site. If we make any material changes to this Cookies Policy, we will notify you either through the email address you have provided us or by placing a prominent notice on our website. Your continued use of the Service after we post any modifications to the Cookies Policy on this page will constitute your acknowledgment of the modifications and your consent to abide and be bound by the modified Cookies Policy. 1101, 11TH Floor, Antriksh Bhawan, 22, Kasturba Gandhi Marg, Connaught Place, New Delhi-110001. 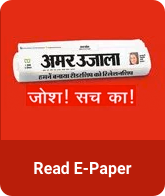 Cookies stored in user’s computer can only be read and accessed by amarujala.com website, not by any other website or users. We place and use the cookies on your computer, these cookies are known as the “First Party Cookies”. Cookies may also be placed and accessed by some of our third party Vendors which are known as “Third party cookies” and are also described as “Session cookies”, which means they are the temporary cookies that are only stored on user’s device while you are visiting our site, other cookies are “persistent cookies” which are stored on the users device for a definite period of time after you leave the website from your previous visit. Users are free to choose if they want to accept the cookies from the site or they can go to the settings on the browser and disable them, but in case if a user disables the cookies then the experience of user on the site can deplete and it may also result in some features not exactly working the way they are intended to work. What is in the amarujala.com cookie and why is it used? Each Cookie stored in a user’s computer contains a small table of data in pairs like (key, data) for example (Last read story, Story Category, Story Geo Scope). Once the data has been read by the server code or user computer, the data can be retrieved and the user is served with the customized data appropriately. The cookie technology is used by amarujala.com to make it easier for the user to use the website. The cookies are also intended to provide the relevant information first to the user for easier and better experience. Essential cookies enable you to navigate the site and use the services/content offered by the website in the best possible way. With these necessary cookies disabled, you may not be able to use the website with its complete functionality and may also affect the smooth functioning of the site. With the cookies disabled, site may not be able to provide all the services or features in their intended specifications. Preference Cookies are placed to collect the information about user’s choices and preferences, and also allow us to make the site function in the way it is intended to. The preference cookies also allow the server to remember the local settings which help in customizing the Site accordingly. Social media Cookies are placed to enable the user to share pages and content which you may find interesting on the site through any third party networking site or any other website. These particular cookies can also be used for the advertising purpose when you visit the website. Analytics cookies are used to collect information about the user’s use of the site & also enable us to improve and improvise the functionality of the site. For Example, these cookies help us know which are the most frequently visited pages on the site, also help us record any difficulties/unused pages on the site and also it shows us whether our advertising is effective or not. The analytics cookies show us the overall usage pattern of the user on the site, it shows usage patterns of all users in one go rather than an individual person. Our team uses this information to analyze the total traffic on the site, but we don’t examine the information individually. Advertising Cookies are used to show the targeted promotions or advertisements based on your interest and browsing patterns on the site or to manage advertising which is being shown to you. The work of these cookies is to collect the information about your activities on site and other websites to provide you most relevant advertising. 4. How can a user manage cookies? You can change the cookie settings in your browser by opting out of the cookies. Most of the browsers automatically accept the cookies as a default option, but the users always have an option to customize their browsers as per their need and desires, where the users can use the settings to decline all the cookies coming from any website as they prefer. But declining to cookies can result in the declined functionality of the website and the users are required to accept cookies if they want to access the complete functionality of the website. Please Note: If Cookies are disabled, not all features of the Site may operate as intended. Please note opting out of the mechanisms of Google analytics will not mean that you will not be shown with any advertising. You will still receive other types of online advertising from participating companies and any type of advertising from non-participating companies, and the sites you visit may still collect information for other purposes.